Anytime a seemingly healthy young person passes away suddenly, the initial reaction is one of disbelief followed by immense grief. When the person is an athlete with seemingly boundless potential, the loss is extremely difficult to reconcile. "The exact cause of his death is currently in dispute..."
"It was something you almost couldn’t completely believe..."
This week, the entire hockey world is mourning the death of Alexei Cherepanov, the 19-year-old New York Rangers prospect, who died during a Continental Hockey League game Monday between his Avangard Omsk club and Vityaz Chekhov. Late in the third period of the game -- one in which Cherepanov scored his 8th goal of the young season -- the right wing returned to the bench after a line change. Shortly thereafter, he went into cardiac arrest and collapsed on the bench. Almost immediately, team trainers attempted to revive him. Cherepanov was carried back toward the locker room. Apparently, there was no defibrillator available and the ambulance usually stationed in the arena had already left the building and had to be recalled. Cherepanov was eventually transported to a hospital in Chekhov, but attempts to revive him were unsuccessful. He was declared dead at 10:55 p.m. Russian time (2:55 p.m. EDT). In a statement, Rangers GM Glen Sather said, "We are extremely saddened by the tragic passing of Alexei. On behalf of the New York Rangers organization, I would like to extend our deepest sympathies to his family. Alexei was an intelligent, energetic young man, with tremendous talent and an extremely bright future." Nicknamed "The Siberian Express" (a play on Pavel Bure's "Russian Rocket") in North America, Cherepanov was known to his friends as "Leshu." 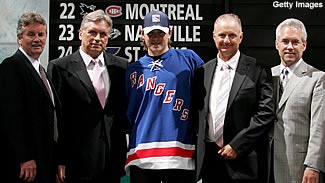 He set the rookie scoring record in the former Russian Super League in 2006-07 and was named to the World Junior Championship All-Star team prior to being drafted by the Rangers with the 17th pick of the 2007 Entry Draft. This season, he had 13 points in 15 games on a club that also features longtime NHL superstar Jaromir Jagr. Cherepanov had a laid-back and self-assured disposition that some mistook for laziness or cockiness. Those who knew him best, however, said that he was a driven young man who was determined to succeed at both the international and NHL levels. He understood that improving his defensive play and becoming more consistent were the two main hurdles he still faced to fully realize his dream. This season, Cherepanov started to keep a blog of the happenings in his career. The first and last entry was dated Oct. 9 -- just four days before his death. In it, he discussed the team's upcoming road trip and gives insights into life on the Avangard team through the eyes of a 19-year-old player. Part of the entry looks at his early experiences playing under Wayne Fleming, a longtime NHL assistant coach and international hockey coach who took over behind the Avangard bench this season. The rest talks about the team's pending road trip, which included Monday's fateful game against Vityaz. "Under Fleming, practices are shorter, but more intensive. We give special attention to our defensive play," he wrote. "… We were recently told to arrive (at the arena) for games in business suits at the directive of our 'Council of Four,' as the press called it: Sasha Svitov, Dmitri Ryabkin, Jagr and Anton Kuryanov. The form of clothing is a matter of discipline. I know that for some of the young players it was necessary to buy suits. I didn't have this problem -- I have two suits hanging in my closet, so I just had to purchase (an extra) coat." When Cherepanov dealt with the North American media, he generally spoke through an interpreter. But when he felt comfortable around people, he'd sometimes unleash a surprise that revealed the playful side of his personality that only his friends and teammates usually got to see. While the exact nature of Alexei Cherepanov's fatal heart stoppage is not yet known, his death appears to be similar to a number of cases in which young and seemingly healthy athletes suffer cardiac arrest. The Minneapolis Heart Institute Foundation has compiled extensive research into the medical causes of this phenomenon, and offers a Web site detailing many of the most common undiagnosed conditions among highly trained athletes. According to the site, a retrospective study of 134 athletes who died suddenly from a variety of cardiovascular diseases showed that only 3 percent were previously suspected to have cardiac disease by virtue of routine tests, and less than 1 percent received a correct diagnosis. The study calls for more research to be done to develop a reliable system for screening athletes for conditions that could potentially lead to tragedy if undiagnosed. "When I covered the Russia-Kazahkstan game at the World Juniors in the Czech Republic last year, I brought a translator with me to talk to the Russian players," recounts Frank Seravalli, a Philadelphia Daily News writer who covered the 2008 World Junior Championships for the tournament's official site. "So I ask Cherepanov the first question and we go back and forth with the translator. "Suddenly, Cherepanov looks at me and says, 'I can't do this to you,' and he's laughing hysterically. He goes, 'I speak English fine,' and we all start laughing. He was very nice -- a total gentleman and an unbelievable athlete." The remoteness of Siberia made Cherepanov a mystery even to many Russian hockey observers as he first rose through the ranks of Avangard Omsk. At 15, he broke through for Avangard-2 (which functions as the club's junior team). In just 28 games, he racked up a staggering 31 goals and 61 points. Two years later, he had his record-setting rookie season in the RSL, while scoring 5 goals and 8 points in seven World Junior Championship games and 5 goals (including the gold-medal winner on a dazzling individual effort) and 8 points in six Under-18 World Junior Championship tilts. There is no telling how far Cherepanov could have gone in the NHL, but the consensus is that he had the potential to be a fine goal scorer if he made the necessary adjustments to his game. The presence of the highly respected Fleming behind the Avangard bench could only have helped him along on that path. The Rangers observed a moment of silence before their Monday night game with the New Jersey Devils at the Madison Square Garden. Around the entire hockey world, there have been outpourings of grief and sympathy for Cherepanov's family.